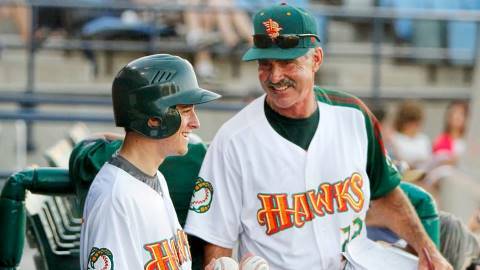 BOISE, Idaho - After two seasons with as part of the Boise Hawks field staff, Bill Buckner has stepped down as the Cubs short-season Class-A hitting coach. "It goes without saying the type of influence Bill Buckner had on our young hitters the last two years, especially in the Northwest League where we lead the league in hitting. It was special for me to witness up close how Buck influenced all of our young hitters throughout the course of a long season. Hitting is the toughest skill to teach in baseball but Buck kept it simple and consistent. He was at his best in the cage helping players build their swing before the game and in the dugout helping them with their approach and plan during the game. The confidence and progress our hitters showed from the start of the season to the end was a direct reflection on Buck's efforts and the trust he instilled with every hitter he worked with," manager Gary Van Tol said in a statement. Buckner, a 22-year MLB veteran served as the Chicago White Sox hitting coach in 1996 and 1997 and was the manager of the Brockton Rox of the CanAm League in 2011. Buckner played for the Cubs from 1977-84 - winning the 1980 National League batting crown and earning a spot in the 1981 All Star Game. A resident of Boise, Buckner played in 2199 major league games with the Dodgers, Cubs, Red Sox, Angels, and Royals, hitting .289 with 174 career home runs and 1,208 RBI. Buckner played in two World Series' - in 1974 with the Dodgers and 1986 with the Red Sox. According to Van Tol, Buckner brought influence to more than just the players during his time with the Hawks. "He had a big influence on me as well. It was a pleasure working with him. He's been in the game a long time and has so much to offer. I learned something from him every day. Hopefully he can sneak out of the house a couple of times during the season and come down to the stadium to throw BP and tell me what I need to do to get better. I wish him, Jody and his family all the best in his retirement….A retirement well deserved." Van Tol will now be joined by Jesus Feliciano as hitting coach and Guillermo Martinez as an assistant coach. Feliciano begins his first season in Chicago's organization after enjoying a 16-year playing career with the Dodgers (1998-2003), Rays (2003-04, 2012), Nationals (2005-06), Mets (2007-11) and the Independent Mexican League (2013). The former outfielder combined to hit .282 (1,571-for-5,576) with 729 runs, 217 doubles, 23 triples, 25 home runs and 482 RBI in 1,621 career minor league games. Feliciano batted .231 (25-for-108) with four doubles and three RBI in 54 big league games with the Mets in 2010 during his only major league season. He was originally drafted by the Los Angeles Dodgers in the 26th round of the 1997 draft out of Academia Discipulos de Cristo High School in Bayamon, Puerto Rico. Martinez is also beginning his first season as a coach in Chicago's organization. He spent last season in Toronto's system as the interim hitting coach for the Vancouver Canadians. He also served as the hitting coach for Toronto's Gulf Coast League club in 2013. Spending his first three years of professional ball in the Marlins organization, he combined to hit .214 (85-for-397) with 11 doubles, one home run and 34 RBI in 143 career minor league games. He also played independent ball from 2009-11, hitting .294 (259-for-882) with 49 doubles, nine triples, six home runs and 86 RBI in 250 games with the Windy City ThunderBolts, Lake County Fielders and Grand Prairie AirHogs. Martinez was originally drafted by the Chicago White Sox in the 17th round of the 2003 draft, but did not sign; He was drafted again in the 15th round of the 2006 draft by the Florida Marlins out of University of South Alabama. Brian Lawrence rounds out the staff as the Hawks pitching coach. Lawrence is a newcomer to the Hawks and the Cubs organization after spending last season as the pitching coach for the San Diego Padres Advanced-A affiliate in Lake Elsinore. A six-year MLB veteran, the former Northwestern State hurler won 50 games in the big leagues with the Padres and Mets, including a 15-win season in 2004.